'God Country' burst onto the comic book market with a mind-blowing debut last month. Donny Cates, Geoff Shaw, and Jason Wordie put together an engaging, heartfelt and jaw-dropping fantasy tale that starts slow and ends with a huge bang. Issue two picks up where the first chapter left off to add some more context to what the hell just happened. A routine visit to his Alzheimer’s-ridden father Emmett after a violent outburst, Roy Quinlan and his family get the shock of their lives as grandpa goes through quite a transformation.Wielding a giant glowing sword and battling a huge demon, the Quinlan's are gobsmacked as grandpa has some explaining to do. The ending of the first issue left readers stunned and delighted with what just went down. Cates has a knack for writing great dialogue and creating fun spectacles. This was no different but Cates also demonstrated just how devasting Alzheimer's Disease can be on a family giving this new series a poignant plotline apart from the fantasy. The mightiest of swords, Valofax, has chosen Emmett and he's in no hurry to give it up. However, a God of War - Aristus - arrives to convince him otherwise. It not only makes an already legendary badass in his younger days a great warrior the sword allows Emmett to recall his memories. Something virtually impossible now without the mystical weapon in his hands. The dialogue between the two, a mortal man and a living god, is refreshingly respectful and illuminating. Emmett describes what Alzheimer's is while Aristus reveals the back story of Valofax. It's all congenial but the story takes quite the cliffhanger by the end. Geoff Shaw and colorist Jason Wordie illustrate a brilliantly paced story in cinematic fashion giving the wide open spaces of Texas the beautiful treatment it deserves. Rich warm colors and great character designs help make the comic a winner. 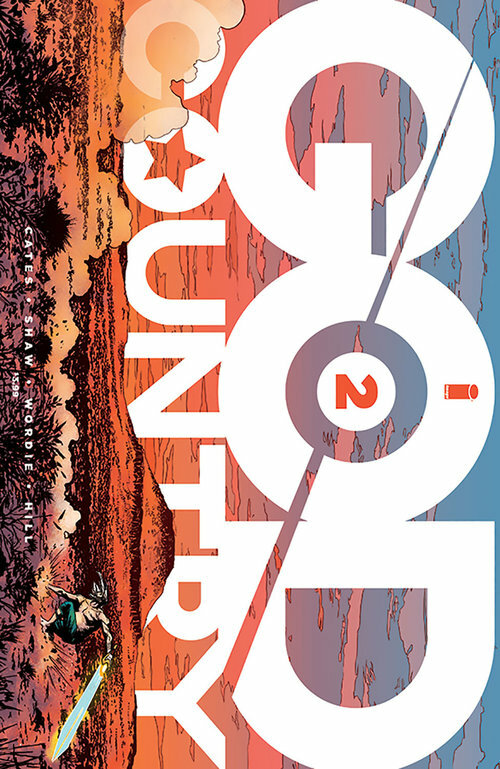 'God Country' #2 proves its exciting debut was no fluke. Here, we get more character development and world building that feels fluid and smart. There's a heart to this fantasy that is as potent as the mighty sword of the gods that Emmett wields. Cates and company have put together a must-read series. Don't wait for the trade, put it on your pull-list now!